During the Dialogue on protracted refugee crises with the UN High Commissioner for Refugees, held in Geneva in December 2008, our high – level delegation presented the problems of refugee population in Serbia. Since the Republic of Croatia official position was that the Sarajevo process is completed and all outstanding issues are resolved, the Republic of Serbia appealed for help through the diplomatic and consular missions in more than 80 countries in solving a number of problems sending a Non paper setting forth the concerns of refugees to exercise their rights in the Republic of Croatia. That same year, the UN High Commissioner for Refugees ranked the Republic of Serbia on a list of five countries with protracted refugee crisis in the world and the country with the highest number of refugees and displaced persons in Europe. 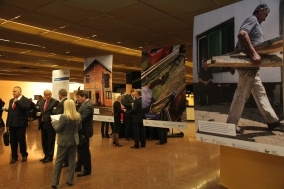 With the intense diplomatic activity and support of the international community, especially UNHCR, OSCE, European Commission, Council of Europe and the U.S., in March 2010 the Regional Ministerial Conference was held in Belgrade and process of regional cooperation aiming at finding durable solutions for refugee problems has officially commenced. 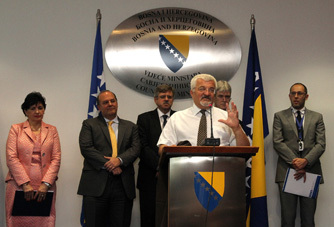 At the conference, the Ministers of Foreign Affairs of Bosnia and Herzegovina, the Republic of Croatia, Republic of Montenegro and the Republic of Serbia issued a joint statement, while the International organizations (EU, OSCE, UNHCR and the Council of Europe) have signed a joint document to support the process of solving outstanding issues that need to be addressed such as occupied tenancy rights, pensions, pending applications for reconstruction, occupied agricultural land, the economic sustainability of return, etc. As a result of the Conference 6 bilateral technical meetings was held between the Republic of Serbia and the Republic of Croatia with the aim of exchanging information relevant to determining the status and needs of the refugee population. These bilateral technical meetings were focused on the collection and exchange of data relevant to the determination of refugee status and the need for a solution and in accordance with the matrix defined and proposed by the UNHCR. UNHCR has also made comparison database returnees to the Republic of Croatia and refugees in the Republic of Serbia, in order to consolidate statistics. After the exchange of data, UNHCR has developed a report on the process and results of data exchange. There were 10 regional and expert meetings of all four countries with the aim of developing projects to help the most vulnerable people. Along with bilateral technical meetings between the institutions of the Republic of Serbia and the Republic of Croatia, meetings at higher levels were held, during the presidential visit, an agreement was reached on the principles of resolving the issue of refugees, including the necessity of the Republic of Croatia to improve its housing program for returnees. The two presidents agreed that at the Donor Conference all the needs of refugees for housing solutions should be displayed as a result of the Regional Programme. At the Conclusion of the Government to accept the proposal of measures to solve the problem of refugees in the Republic of Serbia 05 No: 019-9265/2010, from 9 December 2010 , the project of the Republic of Serbia that was originally focused on solving the problem of persons accommodated in Collective Centres and most vulnerable, and in accordance with the recommendations of the international community and the agreement between the Republic of Serbia and the Republic of Croatia was extended to other persons in need of housing solution (including those who have not achieved their property and tenancy rights). At a technical meeting in Brussels organized by the European Union ( attended by Mr. Pierre Mirel, Mr. Sannino) and the Special Envoy of the UN High Commissioner Mr. Bijlveld on the 18 April 2011 presented by the participating countries presented the expanded joint project in accordance with the recommendations. The reactions of the EU, the main potential donor were negative in terms of the total amount of funds requested, and was deemed necessary to restrict users only to vulnerable groups in order to reduce the total value of the regional project, as well as compliance and progress on other outstanding issues such as the question of pension rights. UNHCR suggested holding of the Ministerial Conference where the four countries would sign a declaration to confirm that all outstanding problems related to the refugee population would be resolved which would close the refugee chapter in the region, and the declaration would serve as an incentive to organize a Donor Conference. At the meeting in Brussels establishment of a more expert groups to review progress and significant issues in this process was agreed and following working groups have been established: the working group dealing with matters of civil status and obtaining documents which is led by Montenegro, working group to establish funding mechanisms and management funds which is responsibility the Bosnia and Herzegovina, working group to draft the Declaration is led by Montenegro and for the working group for informing is responsible the Republic of Croatia and working group for pensions chaired by Republic of Serbia. In the period from the Brussels meeting four bilateral meetings were held between delegations of the Republic of Serbia and the Republic of Croatia on the issues of due but unpaid pensions and convalidation of working experience for pensioners from the Republic of Croatia. Further progress on these issues has to do with getting the data from the Republic of Croatia. International experts were also included in this work group. The Joint Project (presentation: Joint Program for Durable Solutions for Refugees and Internally Displace Persons - Regional Cooperation the Government of Bosnia and Herzegovina, the Republic of Croatia, Montenegro and the Republic of Serbia) was presented in Vienna on the 16 June 2011. The Project of the Republic of Serbia was developed on the basis of the Refugee Needs Assessment Survey conducted in the year 2008, as well as the data from the OTR Holders Analysis. The Republic of Serbia requested 302 million euros to resolve housing needs of 16,780 families (approximately 45,000 individuals).The total value of the amended Regional Programme is 584 million Euros. It was agreed that the housing needs of refugees which are not included in the Regional Programme will be presented at the Donors Conference. Ministerial Conference was held in Belgrade on the 7 November 2011, during which was signed the Joint Declaration. A Donor Conference was held on 24 April 2012 in Sarajevo, and so far has raised 300 million euros for solving the problems of the most vulnerable refugees in the region. The fundraising of the remaining funds will be continued, and project implementation is planned for the next 5 years. After the Donor Conference activities on preparation of projects to be financed through the Donor Fund has commenced as well as establishment of the mechanisms necessary for their successful implementation. For the purpose of development of the project proposals Needs assessment of the most vulnerable refugees has been conducted, and housing needs and preferred housing solutions for 13,486 refugee families has been determined. The first meeting of the Regional Steering Committee of the RHP has been held in November 2012 thus the implementation of The Regional Housing Programme has commenced. The Republic of Serbia submitted project proposal to the of the Council of Europe Development Bank, in January 2013, of a total value of 2 million euros, which envision housing solutions of 195 refugee families through the allocation of construction material for completion and renovation of the inadequate houses and the donation as well as installation of prefabricated houses. In parallel with the preparation for the implementation of the Regional Programme, a dialogue on bilateral and multilateral working groups level, which were established within the regional cooperation process, in order to resolve outstanding issues such as due but unpaid pension to the Croatian citizens who fled to the Republic of Serbia, have been continued . In the period between September 2012 and January 2013, there were four meetings of the participating countries with representatives of the Council of Europe Development Bank and the international community (EU, UNHCR, OSCE and BPRM U.S. Embassy) and discussion of the issues of concern for the successful implementation of the programme has been continued. On the 12 of July 2013. Belgrade hosted the second meeting of the Steering Committee and the third Assembly of donors of the Regional housing program. Meeting was hosted by Dr. Jovan Krkobabić, Deputy Prime Minister and Minister of Labour and Social Policy of the Republic of Serbia, and was attended by the following members of the Board: Damir Ljubic, Minister for Human Rights and Refugees of Bosnia and Herzegovina, Mirela Popovic Stanic, director of Croatian State Bureau for Renovation and Housing, Predrag Boskovic, Minister of Labour and Social Welfare of the Republic of Montenegro, Joost Korte, European Commission Deputy Director General for Enlargement, Anne Richard, Assistant Secretary of State for Population, Refugees and Migration of the U.S, Ambassador Peter Burkhard, Head of the OSCE Mission to Serbia, Vincent Cochetel, Director of UNHCR’s Bureau for Europe and Mikolaj Dowgielewicz, Vice-governor of the Council of Europe’s Development Bank. Members of the Board of the Regional Housing Program praised the progress made in the preparations for the implementation of the program and the establishment of management structures, which provided for the countries of the region a leading role in the implementation of programs and close cooperation with the international community. Given a large number of vulnerable refugees in the region, members of the Board urged all participants in the program to make every effort to make as many refugees in need solve the most important existential problem. Board of Directors also announced that a new round of collecting the missing funds is expected to begin no later than 2014. Issuing a public call for the selection of the beneficiaries for the first wave of RHP, during which will be given 70 prefabricated houses and 125 packages of building materials, has started the implementation of the Regional Housing Project of Serbia. Immediately after the announcement of public calls started a comprehensive information campaign during which the refugees in 21 municipality/city were informed about all the details of the competition. Representatives of the Commissariat for Refugees and Migration of the Republic of Serbia visited during September 2013. all the cities and municipalities that will be awarded prefabricated houses and building materials in the first sub-project of the Regional Project of Serbia, held a presentation of the project, distributed promotional brochures to potential beneficiaries and explain to them how to apply. During an information campaign promotional film about the Regional housing program was broadcast on Radio Television of Serbia and a number of local television stations across Serbia. At the end of September 2013. the Republic of Serbia has submitted a third sub-project of RHP, with a total value of 13.005.871 euros, which will enable construction of 235 flats, a donation of 80 prefabricated houses, 350 packages of building materials and the purchase of 50 households with a garden. After approval by the Assembly of donors, the project will be carried out on the territory of Belgrade. Framework Agreement between the Republic of Serbia and Council of Europe Development Bank (CEB) on the implementation of the Regional Housing Program was signed on the 25th of October 2013. The agreement was signed by Serbian Deputy Prime Minister and Minister of Labour and Social Policy Dr. Jovan Krkobabić, and the Vice Governor of Council of Europe Development Bank Mikolaj Dowgielewicz. This agreement will enable the immediate implementation of RSP and Serbia is the first participant in the Program in which the Framework Agreement will be put into force. The 3rd meeting of the RHP Steering Committee and the 5th meeting of the RHP Fund Assembly of Donors took place in Paris on 6 December 2013. The Assembly of Donors elected a new co-chair for the forthcoming 12-month period: the U.S.A. will leave its place to Switzerland which, together with the European Commission, shall co-chair the RHP Steering Committee and the RHP Fund Assembly of Donors in 2014. The U.S.A. will nevertheless continue to play an active role in RHP even in the future. The Assembly of Donors approved the third wave of project proposals. Those are two new projects to be financed from the RHP Fund: a grant of 4.3 million EUR for the purchase of 101 flats to former tenancy right holders and residents of collective centers in Croatia, and 11 million EUR grant to the Republic of Serbia to provide durable housing solutions in the places of local integration for 715 refugee families, through four different housing modalities. This brings the total number of grants approved in 2013 to 12, with the total value of 61 million EUR. Once implemented, these projects should provide sustainable housing solutions to more than 8,000 vulnerable refugees and displaced persons in the four partner countries of RHP (Bosnia and Herzegovina, Montenegro, Republic of Croatia and Republic of Serbia. A number of major milestones were reached in 2013 so that implementation can continue in a well-prepared environment to enable the Partner Countries to absorb promptly an important amount of already approved grant funds –61 million EUR, of which 15 million EUR for Bosnia and Herzegovina; 12 million EUR for Croatia; 10 million EUR for Montenegro and 24 million EUR for Serbia. The RHP Steering Committee was also informed that the RHP Fund currently holds about 67 million EUR and that in 2014, some 42 million EUR is expected to be paid in. On 14 March, Mr Branko Ruzic, National IPA Coordinator and Minister without Portfolio, signed the first RHP Grant Agreement between Serbia and the CEB. The RHP grant of EUR 1 993 000 will finance the implementation of the first sub-project approved for Serbia by the RHP Assembly of Donors, which will bring permanent housing solutions to 195 families in Serbia through provision of 70 pre-fabricated houses and 125 packages of building materials. The signing of the first Grant Agreement is an important step forward as it will enable CEB to start disbursing RHP Fund resources and allow the Serbian implementing institutions to launch the tenders. The fourth meeting of the Steering Committee of the Regional Housing Programmе (RHP) was held on 23 June 2014 in Zagreb in the premises of Ministry of Foreign and European Affairs of the Republic of Croatia. This was an opportunity for donors, countries participating in the Programme and international actors to summarize achieved concrete progress on the ground and work on a project approved in April 2013 - building for 29 vulnerable families in Korenica in Croatia. Donors praised the countries participating in the Programme for progress. It was pointed out that during the past 12 months, the Regional Housing Programme progressed from the preparation to the implementation phase and the Donor Assembly approved a total of 12 projects during 2013 worth 61 million EUR. During the 4th meeting of the Steering Committee of the Regional Housing Programme (RHP) held in Zagreb on 23 June 2014, Mr Simon Henshaw, Principal Deputy Assistant U.S. Secretary of State, congratulated all Partner Countries for the progress achieved during the past months. In recognition of the important progress achieved, Mr Henshaw announced that the U.S.A. will contribute an additional USD 10 million to the RHP by the end of 2014. This additional commitment will bring the total contribution of the U.S.A in favour of the RHP to USD 20 million, thus confirming its status as the second biggest Donor, after the European Union. Recent floods in the region were discussed during the meeting, as well as their impact on the beneficiaries of the Regional Housing Programme. It was concluded that the flooding will not affect implementation of projects or funds intended for RHP. Тhe seventh meeting of the Assembly of Donors оf the Regional Housing Programme was held in Zagreb on 23 June 2014. On this occasion it was announced that the United States will donate another 10 million dollars for the RHP by the end of 2014. 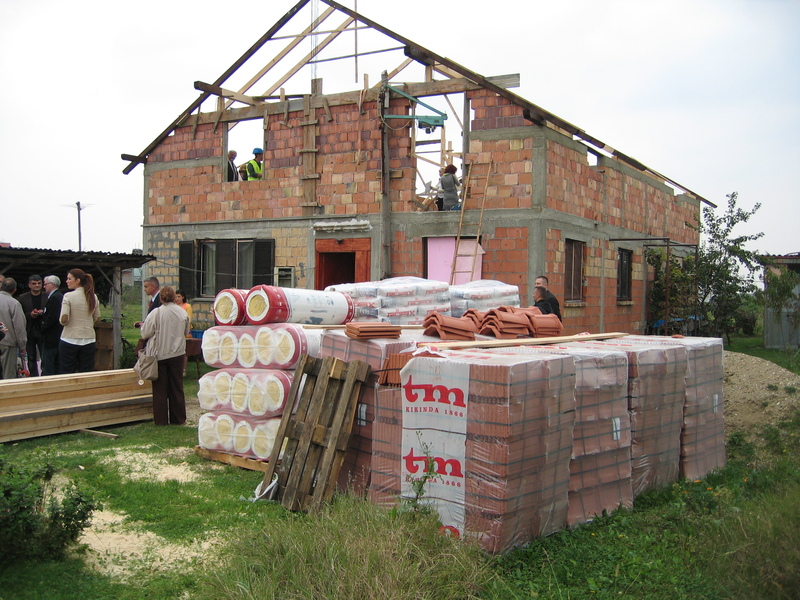 Donors have approved the fourth subproject of Serbia, which will provide housing solutions for 661 refugee families. Its value is approximately 12 million EUR and 10.6 million EUR will be funded from the RHP fund. On Tuesday 2 September 2014 decisions for granting packages of construction materials were handed to 25 users within the final list. These first 25 packages were funded from the contribution of the Republic of Serbia. Seven days later the Government of Serbia signed a grant agreement for the second and third wave of Regional Housing Programme of the Republic of Serbia. The grant agreement, worth 26.7 million EUR, which provides housing for 1,585 of the most vulnerable refugee families in Serbia, was signed by Jadranka Joksimovic, Minister without portfolio responsible for European integration and Stephan Sellen, a representative of the Council of Europe Development Bank. Vladimir Cucić, Commissioner for Refugees and Migration, recalled on this occasion that with this signed agreement continues the implementation of the Regional Housing Programme, which is planned to provide housing for 16,780 of the most vulnerable refugee families in our country during next five years. On the same day, 9 September 2014, there was held a meeting in the premises of the Commissariat for Refugees and Migration with Stephan Sellen, deputy general director of the Council of Europe Development Bank and representatives of the Delegation of the EU, UNHCR and BPRM. The theme was organizing a media event on the occasion of the delivery of the first packages of building materials to beneficiaries, as well as preparations for the info campaign for the second and third wave of RHP. 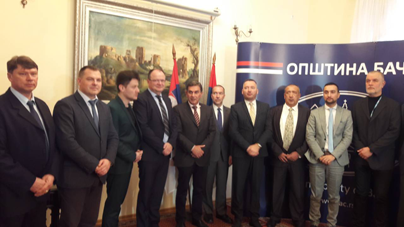 On 2 October 2014 the Republic of Serbia officially marked the delivery of first construction material packages within the first subproject of the Regional Housing Program of the Republic of Serbia, which are financed by the contribution of the Republic of Serbia to RHP. 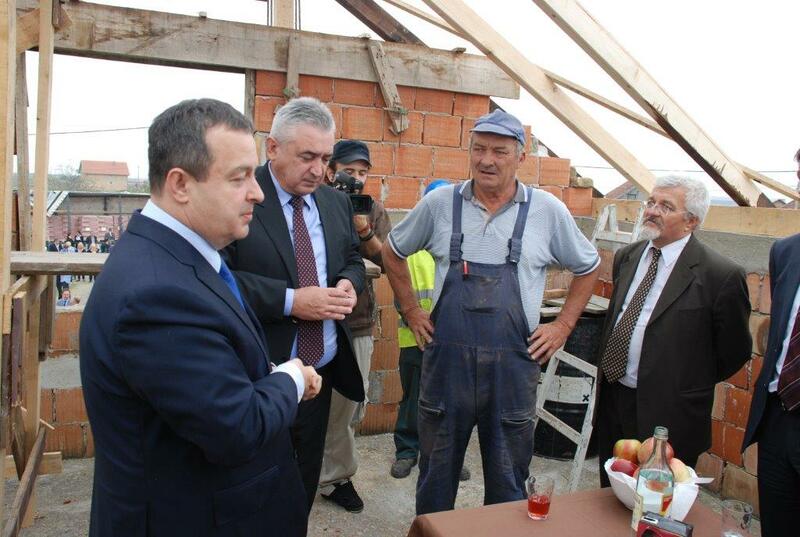 On that occasion Ivica Dacic, First Deputy Prime Minister, Vladimir Cucić, Commissioner for Refugees and Migration of the Republic of Serbia and representatives of the diplomatic corps, visited the beneficiary family in the village of Krnješevci near Stara Pazova and saw the progress of the house completion of the beneficiary who got a package of construction material. Agreements with representatives of nine municipalities and cities, where 200 apartments for refugees will be built within the second sub-project of the Regional Housing Programme of the Republic of Serbia, were officially signed in Stara Pazova. Within the second RHP subproject, which is worth more than 13 million EUR, construction of 200 apartments, 120 prefabricated houses, 300 packages of construction materials and 250 rural households is planned. Agreement on a donation for the fourth wave of the Regional Housing Program of the Republic of Serbia was signed on 6 November 2014 in the premises of the Government of Serbia. Agreement on a donation worth 11,842,699 EUR, which provides housing for the most vulnerable refugee families in Serbia, was signed by Jadranka Joksimovic, Minister without portfolio in charge of European integration and Stefan Selen, a representative of the Council of Europe Development Bank. This RHP subproject will provide 261 residential unit, 30 prefabricated houses, 300 packages of construction materials and 70 rural households, thus housing solution will reach the 661 affected family. 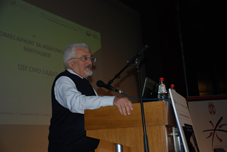 On 4 November 2014 public call was announced for the allocation of 120 prefabricated houses to the beneficiaries within the second sub-project of the Regional Housing Program of the Republic of Serbia. Refugees and former refugees who live in the cities of Zrenjanin, Kragujevac, Pancevo, Smederevo, Sremska Mitrovica, Loznica and Sabac and municipalities Aranđelovac, Backa Palanka, Vrsac, Žabari, Irig, Kula, Koceljeva, Odžaci, Petrovac, Pećinci, Prokuplje, Ruma, Sečanj, Bela Palanka, Srbobran, Sremski Karlovci, Zemun, Temerin, Topola, Ub and Sid and city municipalities of the City of Belgrade - Barajevo, Zvezdara, Obrenovac, Palilula, Rakovica, Savski venac, Surcin and Cukarica and who are interested in the program of donation and installation of prefabricated houses, from 4 November to 19 December 2014 can submit applications and supporting documentation. Refugees and former refugees who live in the cities/municipalities Kikinda, Vrsac, Sid, Sabac, Bjelovar, Paracin, Krusevac, Prokuplje and are interested in leasing appartments with the possibility of purchase them or in social housing in protected conditions without the possibility of purchase in Sremska Mitrovica (beneficiaries pay housing costs, but not the lease), may submit the application and required documentation starting from 31 October till 9 December 2014. Information campaign for the beneficiaries started after the announcement of public calls. It included visits to the municipalities where the programs are being implemented, paid advertisements in the media and broadcasting of radio and TV spots that inform beneficiaries. 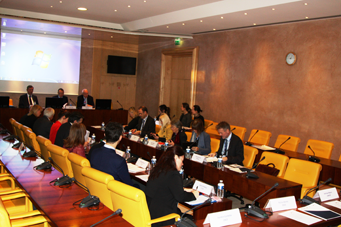 Eighth Assembly of the RHP donors and the fifth meeting of the Steering Committee were held in Paris on 20 November 2014. This occasion brought together representatives of RHP partner countries, donors, representatives of the Council of Europe Development Bank, OSCE and UNHCR. Participants discussed the achieved progress and the priorities for the next period. The Assembly of donors approved four new sub-projects, one for each country. Serbia's fifth sub-project involves building 1,262 apartments, 250 packages of construction materials and 200 rural households. 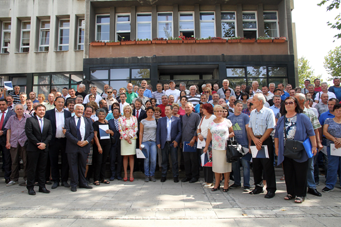 Public calls for the allocation of 261 housing units within the fourth sub-project of the Regional Housing Programme of the Republic of Serbia in the municipalities/cities Arilje, Bor, Vrnjacka Banja, Odžaci, Sombor, Stara Pazova, Subotica, Uzice, Loznica, Brus, Kladovo, Negotin and Zrenjanin, were announced from 25 December 2014 to 12 January 2015. The deadline expired on 11 February 2015. Refugees and former refugees who live in the cities/municpalities of Krusevac, Pozarevac, Smederevo, Žabalj, Kovin, Titel, Cicevac, Han, Negotin, Gornji Milanovac, Ivanjica, Petrovac, Topola, Svrljig, Soko Banja, Kursumlija, Babušnica, Lajkovac, Trstenik, Priboj, Mionica, Backi Petrovac, Despotovac, Paraćin, Raska, Indjija, kikinda, Sid and Čajetina, and are interested in program of donation and installation of prefabricated houses, from 15 December 2014 until 29 January 2015 were able to submit application and supporting documentation. 30 prefabricated houses are going to be awarded within the fourth sub-project of the Regional Housing Programme of the Republic of Serbia. Contract with the City of Belgrade on the construction of 235 housing units and 80 prefabricated houses and allocation of 350 packages of construction materials and 50 rural households under the third sub-project of the Regional Housing Programme of the Republic of Serbia was signed on 6 April 2015 in the Belgrade City Assembly. The contract was signed by Mr. Vladimir Cucić, Commissioner for Refugees and Migration, Belgrade Mayor Mr. Sinisa Mali and Mr. Goran Kvrgić, Director of Project Implementation Unit. The value of these housing solutions amounts to 13,642,918 euros. The third RHP wave is designed for providing of the housing solutions to the most vulnerable refugee families in Belgrade. Public calls within the third RHP subproject for the allocation of 350 packages of construction materials in the maximum amount of 9,000 euros in dinar equivalent per package per family household, then the program of lease of 235 housing units with the possibility of purchasing (residential units are rented for a limited time with possibility of purchase under the terms set in the Law on refugees), as well as addressing the housing needs with the allocation of 80 prefabricated houses for refugees who own land on which individual housing construction is possible, were announced on 12 May and lasted until 26 June 2015. 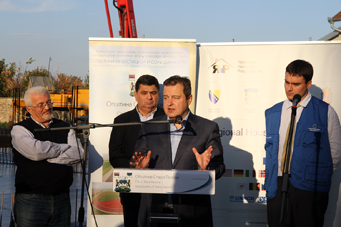 The third RHP subproject provides allocation of 50 households on the territory of Belgrade. Donation is non-refundable and shall be granted for the housing needs of refugees through the purchase of village houses with garden up to 9,500 euros (in RS dinars) and awarding of aid package (building materials and equipment in order to improve living conditions) totalling 1,500 euros (in RS dinars) per family household. Selected beneficiary can participate in the realization with his own funds to help solve the housing needs up to 50 percent of the amount intended for the purchase of a rural household. Potential beneficiaries were informed on 11 May 2015 that the public call for applications for rural households will be published on 25 June 2015. During this period beneficiaries are expected to find a rural household. The third sub-project of the Regional Housing Programme is jointly implemented by the Commissariat for Refugees and Migration of the Republic of Serbia, City of Belgrade and PIU Research and Development. Public calls for selection of beneficiaries for the allocation of 235 housing units, 80 prefabricated houses and 350 packages of construction material were issued on 12 May 2015, while the public call for donation in the purchase of 50 rural households was issued on 25 June 2015. 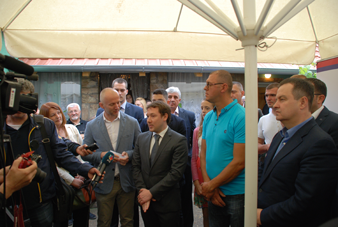 On 29 June 2015 press conference and visit to the beneficiary family Škorić in the village of Nikinci marked the delivery of 104 packages of construction material under the first sub-projects, which were financed by the RHP Fund. This is the first tranche of delivery, which was completed in early July 2015. 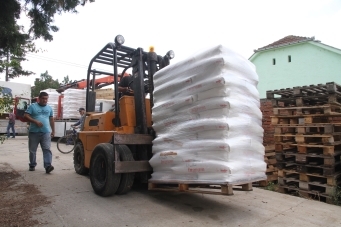 Delivery of construction material to the family of Mr. Bogdan Škorić, a refugee from Croatia, who lives in the village of Nikinci, Ruma municipality, was attended by Mr. Ivica Dacic, First Deputy Prime Minister and Minister of Foreign Affairs, Mr. Vladimir Cucić, Commissioner for Refugees and Migration, Ambassador Michael Davenport, Head of the EU Delegation in the Republic of Serbia, Mr. Gordon Duguid, Deputy chief of Mission - Embassy of the United States, Ms. Isabel Perich from the Swiss Cooperation Office for Serbia - Embassy of Switzerland, Mr. Vladimir Bilandžić, special advisor for measures to strengthen confidence and security - the OSCE mission to Serbia, Mr. Hans Friedrich Schodder, the UNHCR Representative for Serbia. The sixth meeting of the RHP Steering Committee and the tenth RHP Fund Donor Assembly were held on 29 and 30 June 2015 in Podgorica in Montenegro. Rolf Wenzel, Governor of the Council of Europe Development Bank, said that "although the RHP is a complex program, partner countries implemented it very well," and stressed that the focus should be on delivering more housing solutions to the beneficiaries, in order to achieve the best results in the field. Donors, partner countries in the Programme and international stakeholders agreed that, despite many challenges, the RHP is progressing well, so in 2014, the beneficiaries got the first housing solutions. This was an opportunity for the RHP stakeholders to see concrete results on the ground, so the RHP delegation visited the construction site in the Montenegrin town of Nikšić, where the building will be built for 62 internally displaced families. The delegation also visited the collective center Konik, where will begin construction of two buildings for 120 vulnerable families. 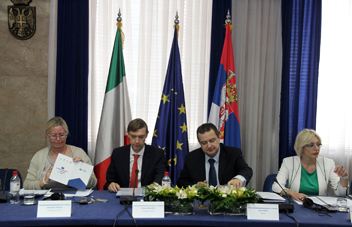 СIn mid-August 2015, grant agreement for the fifth sub-project within the Regional Housing Programme of the Republic of Serbia between the Republic of Serbia and the Council of Europe Development Bank was signed. The signed contract will provide funding and allocation of aid to the most vulnerable refugee families in the amount of 46,773,758 euros. There are 1,262 apartments, 250 packages of construction material and 200 village houses for refugees. 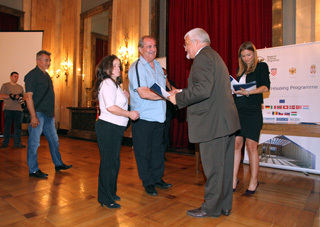 In the premises of the Serbian National Theatre in Novi Sad, on 31 October 2015 contracts were officially handed over to the representatives of the 61 local self-governments, where within the second, fourth and fifth sub-project of the Regional Housing Project of the Republic of Serbia (RHP) will be built flats, allocated packages of construction material and provided housing solutions through the provision of financial assistance for the purchase of rural households. There are more than 2,000 permanent and sustainable housing solutions, with a total value of 47.5 million euros. 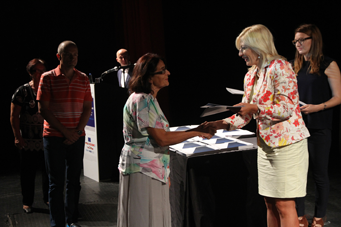 On 27 June 2016 in the Conference Hall of the City of Belgrade refugee families residing in the city of Belgrade received the grant agreements for the purchase of 69 rural households, and a package of additional aid, as part of the third sub-project of the Regional Housing Programme of the Republic of Serbia. Public call originally planned purchase of 50 village households. But, extra engagement allowed purchasing of houses for all beneficiaries in the city of Belgrade who met the requirements, so the number of houses reached 69. The event was opened by Mr. Ivica Dačić, First Deputy Prime Minister, Foreign Minister and President of the Commission for Coordination of Permanent Refugee Integration of the Government of the Republic of Serbia. After that participants were addressed by Ms. Jadranka Joksimovic, Minister without portfolio in the Government of the Republic of Serbia in charge of European integration, Mr. Vladimir Cucić, Commissioner for Refugees and Migration, Mr. Andreja Mladenovic, Deputy Mayor of Belgrade, Mr. Oskar Benedict, Deputy Head of the EU Delegation to Serbia, Mr. Gordon Duguid, Deputy Head of Mission of the Embassy of the United States, Mr. Igor Burazin, a representative of the Council of Europe Development Bank, Mr. Hans Friedrich Schodder, UNHCR representative for Serbia, Mr. Michael Uyehara, Deputy Head of the OSCE Mission and Mr. Dragan Ivkovic, representative of the PIU "Research and Development". On 28 June 2016 in Sarajevo, Bosnia and Herzegovina, was held the eighth meeting of the RHP Board of Directors and the twelfth meeting of the RHP Fund Assembly of Donors. Four years after the donor conference which launched the RHP, all actors gathered again in Sarajevo to summarize what has been achieved and what still remains to be done. The meeting was attended by the RHP partner countries Bosnia and Herzegovina, Croatia, Montenegro and Serbia, the RHP donors, the European Union, the United States, Germany, Switzerland, Italy, Norway and Turkey, as well as implementing partners UNHCR, OSCE and the CEB. Partner countries have presented achieved so far and emphasized the successful cooperation between them, which is the result of joint work under the auspices of the RHP. Stakeholders have also pointed out that 2015 and 2016 were crucial years, during which hundreds of beneficiaries were moved into the housing units in all four partner countries. Mr. Vladimir Cucić, Commissioner for Refugees and Migration of the Republic of Serbia, said: "I am very pleased that the donor countries, although they are hard hit by migrant crisis, still keep their promises concerning the RHP. Some talk about that we should enforce the four partner countries to cooperate. The RHP proves that this is not true, because we cooperate in the best way. " The 9th meeting of the RHP Steering Committee and the 13th meeting of the RHP Fund Assembly of Donors took place on 1 December 2016 in the premises of the Council of Europe Development Bank in Paris. The European Union, represented by the European Commission, the RHP’s biggest donor, announced its intention to commit fully the amount initially pledged to the RHP. The new funds should allow the financing of up to 3 000 additional housing units by 2021. Regional Housing Program (RSP), which in Serbia aims to provide housing solutions for the most vulnerable refugee families from Bosnia and Herzegovina and Croatia, is in full swing. Mr. Vladimir Cucić, Commissioner for Refugees and Migration, said today in Novi Sad at the press conference organized in the framework of the annual meeting of the local trusteed for refugees, which this time is dedicated to the RHP, that so far six subprojects were approved totalling 104 million euros. These projects should provide housing solutions for some 5,200 families, or about 15,000 refugees. "Serbia plans with this program in 2017 to provide 2,000 new housing solutions for refugee families. In addition to the more than 4,000 already approved beneficiary families, some 8,000 additional families have been identified being eligible and have not resolved their housing problems. There is an ongoing or about to start construction of apartments in Belgrade, Novi Sad and Sremska Mitrovica, while in the more than 100 local communities rural households have been provided. More than 100 commissions are working to determine who meets the criteria and that the money is spent most adequately," said Commissioner Cucić. 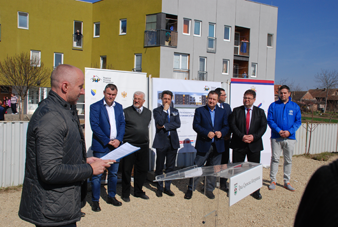 Foundation stone for the construction of 40 apartments for refugees from Bosnia and Herzegovina and Croatia under the second sub-project of the Regional Housing Project of the Republic of Serbia (RHP) was laid today in Sremska Mitrovica. Construction works will take 11 months, and the work is performed by the Construction Company "Dijagonala". 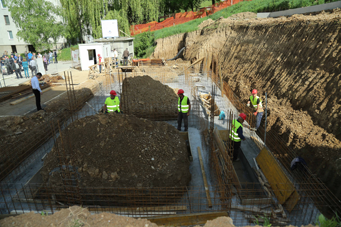 Sremska Mitrovica is the first of nine municipalities in which this year begins the construction of apartments under the second RHSP sub-project. Ttotal of 200 apartments will be built in Krusevac, Paracin, Vrsac, Prokuplje and Bajina Basta (20 in each), in Sabac and Kikinda (25 in each) in Sid 10 apartments. In these municipalities refugees will be awarded homes to lease with the possibility of a later purchase at discount prices, while 40 flats in Sremska Mitrovica are intended for social housing in a supportive environment for the most vulnerable refugees, the elderly and single-parent families and those with sick members, without the possibility of purchase. Groundbreaking ceremony was attended by numerous senior local officials, representatives of international organizations and ambassadors of donor countries. 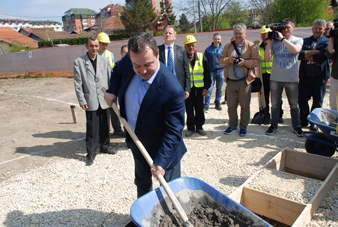 On behalf of the Serbian state first concrete shovel on the foundation stone was thrown by the First Deputy Prime Minister, Foreign Minister and President of the Commission for Coordination of Permanent Refugee Integration of the Government of the Republic of Serbia Mr. Ivica Dacic. 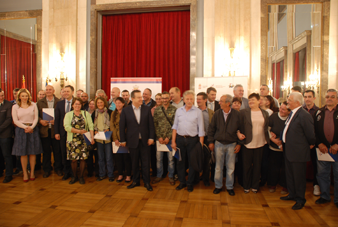 On the 29 Martch 2017 in the Belgrade City Assembly, 49 ferugee families from Bosnia and Hercegovina and Croatia were awarded contracts for delivery of prefabricated houses, part of the RHP SRB 3 sub-project. The contracts were handed over by the First Deputy Prime Minister Mr Ivica Dacic and the Mayor of Belgrade Mr Sinisa Mali, Mr Vladimir Cucic, Commisioner for Refugees and Migration and other stakeholders. The foundation ston ceremony for 20 apartments for refugees from Bosnia and Hercegovina and Croatia took place on March 30, 2017 in Krusevac. Refugees will be awarded homes to lease with the possibility of a later purchase at discount prices. Construction works will take 11 months. The very nex day, on March 31, 2017 the foundation stone was laid down in Prokuplje for additional 20 apartments, under the second sub-project of the Regional Housing Project of the Republic of Serbia (RHP). The second RHP sub-project is worth more than 13 milion euros. On April 6, 2017 the foundation stone was laid in Paracin for another 20 apartments under the second sub-project RHP. On behalf of the Serbian state, first concrete shovel on foundation stone was thrown by the First Deputy Prime Minister, Foreign Minister and President of the Commission for Coordination of Permanent Refugee Integration of the Government of the Republic of Serbia Mr Ivica Dacic. On 21 April, 2017, the foundation ston ceremony for 20 apartments for refugees took place in Vrsac. Refugees from Bosnia and Hercegovina and Croatia will be awarded homes to lease with the possibility of a later purchase at discount prices. It is expected that the construction works will be finished in 11 months. On 23 May 2017 press conference and visit to the beneficiary family Pavlovic in Srbobran marked the dilivery of the 319 packages of construction material under the second sub-project RHP. Dilivery of construction material to the family Pavlovic, a refugee from Croatia, was attended by Mr Ivica Dačić, First Deputy Prime Minister and Minister of Foreign Affairs, Mr Vladimir Cucić, Commissioner for Refugees and Migration, Mr Nicolas Bizel, from the EU Delegation to Serbia, the Meyor of Srbobran Mr Neško Čestić, and other domestic and foreign officials. The 14th meeting of the RHP Fund Assembley of Donors and the 10th meeting of the RHP Steering Committee took place in Belgrade on 26 June 2017 at the Palace of Serbia. The Assembley of Donors decided to approve Serbia new project worth in total 19,9 EUR million, as well as new project to Bosnia and Hercegovina worth 11,1 milion. The meetings were attended by the RHP Partner Countries Croatia, Bosnia and Herzegovina, Montenegro and Serbia, the RHP Donors the EU, the U.S.A, Italy, Germany and Switzeland, as well as the RHP implementing partners UNHCR, OSCE and the CEB. The Steering Committee meeting was opened by the Acting Prime Minister and Minister of Foreign Affairs of Serbia Mr Ivica Dacic and by the Minister in charge of EU Integration Ms Jadranka Joksimovic. The Acting Head of the EU Delegation in Belgrade Mr Oskar Benedikt, the U.S. Ambassador H.E. Mr Kyle Scott and the Ambassador of the Germany H.E. Mr Axel Dittmann also addressed the participants. On 27 June 2017, the family of Mrs Milosava Gnjatović from Pančevo was the thousandth being awarded a roof over the head under the Regional Housing Programme (RHP). Mr. Ivica Dačić, First Deputy Prime Minister, Minister of Foreign Affairs and President of the Commission for Coordination of the Process of Permanent Integration of Refugees of the Government of the Republic of Serbia handed over the keys of prefabricated house to the Gnjatović-Marić family. On that occasion, Minister Dačić thanked the present donors and invited them for further cooperation, as there are about 7,000 families waiting for the provision of the housing solution. Оn the 1st of September 2017, in the premises of cultural institution „Vuk Stefanović Karadžić“, contracts have been solemnly awarded on granting of 302 packages of building materials to refugees from Bosnia and Herzegovina and Croatia, who have their residence in the territory of Belgrade. Building material packages worth up to 9,000 euros are financed by donor funds from subproject 3 of the Regional Housing Programme. The main donor of RHP is the European Union. Ceremony has been opened by Mr. Ivica Dačić, First Deputy Prime Minister, Minister of Foreign Affairs and President of the Commission for Coordination of the Process of Integration of Refugees of the Government of the Republic of Serbia. „I am proud to point out that within the RHP more than 1,000 housing solutions have been awarded to the same number of refugee families. Since the beginning of the implementation of the Programme, more than 123 million EUR have been approved to Serbia, and it is up to us to ensure that this money provides housing solutions for as many vulnerable refugee families as possible“, said Minister Dačić. Minister in charge of European Integration Ms Jadranka Joksimović emphasized that the RHP should be a message of the applied humanity of the international community and the responsibility of our state to do everything to make the life of the refugees, which was undoubtedly difficult, to be better and simpler with prospects for better childhood. Ms Joksimović announced that another contract will be signed very soon, 7th subproject, worth 9,2 million euros, as well that she hopes that in the following period problems of a large number of families will be solved. Commissioner for Refugees and Migration Mr. Vladimir Cucić said that today a big part of subproject 3 ends, which is worth 13,6 million euros, referring to refugees who live in Belgrade. He pointed out that the construction of the settlement in Ovca is in progress, which should be completed in November. According to him, 555 families have been directly helped in Belgrade. Mr. Cucić especially thanked the donors and the Government of Serbia and the City of Belgrade, but above all refugees who had the patience to wait 20 years and trusted that they would be helped. The audience was also addressed by Deputy Mayor Mr. Andreja Mladenovic, Mr. Nicolas Bizel, Head of the Section for Justice, Home Affairs and Support for Social Inclusion at the EU Delegation to the Republic of Serbia, Mr. Stefan Selen, Deputy Director of the Directorate General for Loans and Social Development of the Development Bank of the Council of Europe,HE Andrea Oricio, Ambassador, Head of the OSCE Mission to Serbia, Mr. Hans Friedrich Schodder, Head of the UNHCR Office in Serbia, and Mr. Dusan Bubulj, beneficiary refugee from Bihac. An event was organised on October 13, 2017 in Golubinci, near Stara Pazova, to mark the beginning of works on the construction of apartments for refugees from Bosnia and Herzegovina and Croatia under the Regional Housing Programme (RHP), sub-project SRB4. 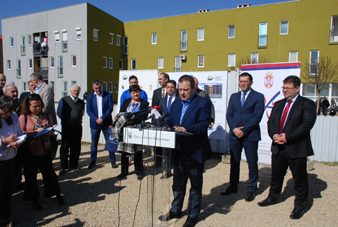 The sub-project SRB4 foresees, among other things, the construction of 261 housing units in 13 municipalities. “In the past years, I have had the privilege to be regularly involved in various events marking the progress of the Regional Housing Programme. It is an honor and a pleasure to be part of a project that truly changes the lives of people, but it is also a responsibility to meet the expectations of families that have lived in difficult conditions for over 20 years and to ensure that the Regional Housing Programme is fully implemented”, said Deputy Prime Minister Dačić. Vladimir Cucić, Serbian Commissioner for Refugees and Migration, emphasized that the Regional Housing Programme in Serbia is being implemented very intensively and that the Government of Serbia is seriously committed to the completion of this Programme. Participants were also addressed by Paul-Henri Presset, representative of the European Union Delegation to Serbia, Joseph Mellot, Deputy Head of the OSCE Mission to Serbia, Andrej Kazakov, UNHCR Representative, and Đorđe Radinović, Mayor of the Municipality of Stara Pazova. Under the auspices of the Commissariat for Refugees and Migration of the Republic of Serbia and with the support of the Council of Europe Development Bank, the 13th General Trustees’ Meeting was held from November 6 to November 8, 2017 in the town of Kladovo. The central theme was the Regional Housing Programme - progress in implementation and deadlines for the implementation of the RHP. 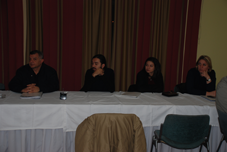 The second day of the meetings was dedicated to the asylum and the work of the trustees in Kosovo and Metohija. 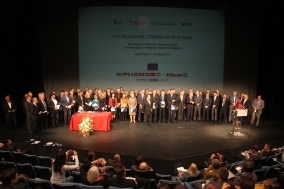 The Meeting was attended by more than 450 participants - representatives of international organizations, institutions and embassies (the Delegation of the European Union in Serbia, the Council of Europe Development Bank, the US Embassy, UNHCR), numerous guests from the region (Croatia, Bosnia and Herzegovina, Montenegro and Macedonia), OSCE, IOM, DRC, UNDP, Ministry of Public Administration and Local Self-Government and the Municipality of Kladovo. Prior to the opening ceremony, a film on the activities of the Commissariat for Refugees and Migration in 2017 was presented - in the field of care for migrants (asylum), the closure of collective centers and the care for refugees from Bosnia and Herzegovina and Croatia through the RHP (featuring the progress of the Programme in the region), along with the activities in the field of readmission, the work of the Commission for Missing Persons, and trustees in Kosovo and Metohija. During the opening of the 13th Working Meeting, Commissioner for Refugees and Migration Mr. Vladimir Cucić asked the Trustees and other parties involved in the implementation of the RHP to maximize their efforts in order to ensure that the funds allocated by the donors for the housing care of refugees are spent and that all persons in a need of housing are taken care of. The Commissioner emphasized that the deadlines are limited. "I would like to thank all donors, especially the European Union, who is not only the largest donor for the RHP, but it also provides significant funding in the field of asylum," said Commissioner Cucić. On behalf of the European Union Delegation to Serbia, Ms. Brigit Kuchar addressed the meeting. "Your contribution is greater than the allocation of municipal land or the choice of beneficiaries. Your contribution is in the integration of refugees into local communities, which I thank you for, "Kuchar said addressing the delegates in the large hall of the Cultural Center in Kladovo. Kladovo Mayor Mr. Radisav Čučulanović stressed that homeless persons are counting on the Trustees and expressed sincere wishes that all the activities pertaining to the care for refugees are completed as soon as possible. Mr. Radovan Arežina, on behalf of the Ministry of State Administration and Local Self-Government, told the gathered attorneys that he would inform the Minister Ružić about the problem some of the commissioners have with the extensive number of reports. Melita Mihajlovska from the Council of Europe Development Bank said that Serbia is the biggest beneficiary of the RSP and that the donations should be used within the next three and a half years. Ms. Mihajlovska emphasized that Serbia is not alone in this endeavor, but will have the maximum support of the CEB and other international institutions involved in RHP. 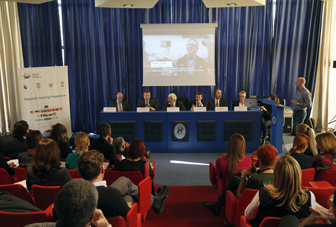 Participants were also addressed by Sam Healy (US Embassy), Jan Lueneburg (OSCE), Andrej Kazakov (UNHCR), Dušan Kozarev (Office for Kosovo and Metohija), Nina Miskovic (BiH), Davor Čordaš (Republika Srpska), Željko Božic (Croatia) and many others. During the second working day, a parallel regional event dedicated to the exchange of experience in the field of asylum was organized within the project Support to the Migration Management System in the Republic of Serbia, financed by the State Secretariat for Migration (SEM) of the Swiss Confederation, and with the additional support of the Danish Migration Board. The event brought together officials from Bosnia and Herzegovina, Croatia, Macedonia and Serbia dealing with asylum and migration issues who exchanged experiences and models of good practice regarding migrants and asylum seekers. The main challenges were also considered, as well as the latest trends and statistics on the number of migrants and asylum seekers. Commissioner for Refugees and Migration Vladimir Cucic participated at the 15th meeting of the RHP Fund Assembly of Donors which took place on 29 November 2017 at the CEB’s premises in Paris. With nearly 3,000 vulnerable families housed at end-2017, the stakeholders jointly expressed their satisfaction with the current progress and with the impact that the programme has on regional reconciliation in the Western Balkans. Тhe Regional Housing Programme is a unique post-conflict reconstruction programme, not only in the region but also worldwide. It makеs an important contribution to addressing poverty reduction, social inclusion and economic empowerment, as well as supporting Serbia, Bosnia and Herzegovina and Montenegro in their EU accession process. 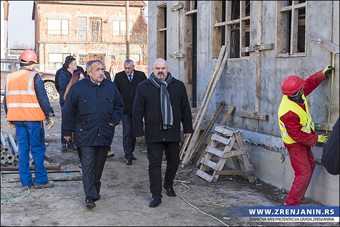 Assistant Commissioner for Refugees and Migration Ivan Gerginov accompanied by Mayor of Zrenjanin Cedomir Janjic visited the construction site for 11 apartments for the most vulnerable refugee families from Croatia and Bosnia and Herzegovina. The funds for the construction in the amount of 274,000 euros come from the donation of the Regional Housing Program - subproject 4 through the Council of Europe Development Bank. The city of Zrenjanin provided construction land along with the necessary infrastructure. Assistant Commissioner Ivan Gerginov emphasized the excellent cooperation with the local self-government in Zrenjanin and announced the upcoming construction throughout the next year. "In addition to the 11 apartments worth 33 million dinars, construction of 40 more apartments in Pancevacka street will soon begin, as well as another 26 apartments in Klek," Gerginov said. On the same day, the City Hall hosted a round table on "Strengthening the capacity of the local self-government units of the city of Zrenjanin in the field of migration management" organized by the Commissariat for Refugees and Migration of the Republic of Serbia and the City of Zrenjanin. 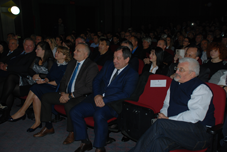 In addition to Ivan Gerginov, the Assistant Mayor of Zrenjanin, Simo Salapur, attended the gathering. 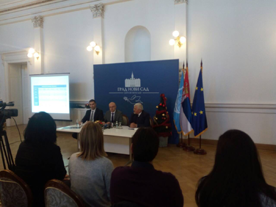 Commissioner for Refugees and Migration Vladimir Cucic, Mayor of Novi Sad Milos Vucevic and President of the Committee for resolving housing issues of refugees Zarko Micin announced in the City Hall of Novi Sad that apartment buildings for refugees will be built in Futog and Veternik. 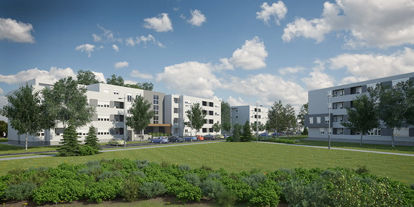 The City of Novi Sad provided locations where 276 apartment units in Veternik along with 152 units in Futog will be built from the donor funds under the Regional Housing Programme (RHP), subproject 5. Commissioner Cucic thanked the Major and the City management for finding the way to realize this important project. „We are not talking only about Futog and Veternik, but also of one more location in Veternik, where additional 70 apartment units will be built under subproject 9, after the decision at the Donor’s Assembly in Paris, Cucic said. He added that we should be proud that Novi Sad is, at the moment, one of the country’s biggest construction sites for social needs. Mayor of Novi Sad pointed out that the fellow citizens who fled from the war destruction during the 90s will finally resolve their housing problems. „Due to the efforts of the Commissariat for Refugees and Migration and Project Implementation Unit, the beginning of 2018 will mark the commencement of the construction of 276 apartments in Veternik. The budget for the following year provides for 24 million dinars for equipping the location, while the Commissariat enabled the donor funds, “he concluded. 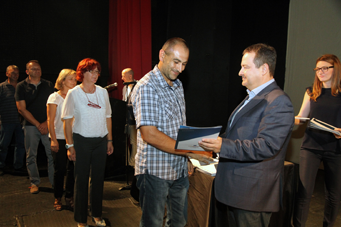 Ceremonial awarding of agreements for the purchase of 21 village houses for refugees families from the Republic of Croatia and Bosnia and Herzegovina, under the Regional Housing Program, sub-project 5 was organized in the Municipality of Bac. Financial resources in the amount of 231 000 euros are provided from the Donor Fund of the Regional Housing Program, through the Council of Europe Development Bank. Each beneficiary was allocated the total of 11 000 euros, out of which 9 500 euros were for the purchase of village houses, along with the small grant of 1 500 euros. Subproject 5 is worth a total of € 46.7 million, out of which the international donations amount to 36.3 million euros while the Republic of Serbia contributed 10.4 million euros. Apart from the host of this RHP event, Mr. Borislav Antonic, President of the Bac Municipality, the beneficiaries were also addressed by the Assistant Commissioner Ivan Gerginov, the Provincial Secretary for Social Policy, Demography and Gender Equality, Predrag Vuletic, Representative of the EU Delegation to Serbia, Brigitte Kuchar, Balkans Regional Refugee Coordinator from the American Embassy, Sam Healey, Deputy Head of OSCE Mission to Serbia, Joseph Mellott, Senior Field Coordinator of the UNHCR Representation in Serbia, Andrej Kazakov and Director of the Fund for Assisting Refugees, Expelled and Displaced Persons, Dusko Cutilo. Representatives of the Embassy of the Slovak Republic in Serbia accompanied by the Deputy Head of Mission Igor Vencel as well as the representatives of the Project Implementation Unit attended the RHP event as well. Five vulnerable refugee families from Bosnia and Herzegovina and Croatia received purchising agreements for village houses in the municipality of Knjazevac within the fifth subproject of the Regional Housing Program (RHP). Mayor of Knjazevac, Milan Djokic, as a host of the event and Jelena Marjanovic, representative of the Commissariat for Refugees and Migration, addressed the beneficiaries. Funds in the amount of EUR 55 thousand for the purchase of rural houses are provided from the Donor Fund of the Regional Housing Program, through the Council of Europe Development Bank as well as from the national contribution of the Republic of Serbia. The ceremonial beginning of construction of 25 apartments for refugees from Bosnia and Herzegovina and Croatia, residing in the territory of Kikinda, was held today in the City of Kikinda, under the second subproject of the Regional Housing Program in the Republic of Serbia (RHP). The total value of the construction is 601.988 euros with the funds provided mostly from the Donor Fund of the Regional Housing Program, where European Union is the main donor. The actual construction of apartments started on the location of Pere Segedinca 7 with a symbolic laying of foundation stone, while the deadline for the completion of the construction is within the next 11 months. 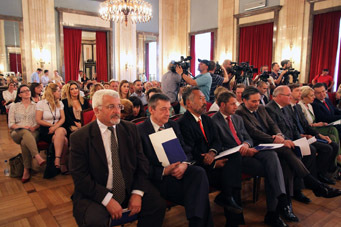 The ceremony was attended by Ivica Dacic, First Deputy Prime Minister of the Government of the Republic of Serbia, Minister of Foreign Affairs and President of the Commission for Coordination of the Process of Permanent Integration of Refugees, Vladimir Cucic, Commissioner for Refugees and Migration, Pavle Markov, Mayor of Kikinda, Joseph Mellott, Deputy Head of the OSCE Mission to Serbia, Andrei Kazakov, Senior Field Coordinator of the UNHCR Representation in Serbia, representatives of the Project Implementation Unit and the beneficiaries. "I am honored to be part of a project that addresses the existential issues and provides a roof over the head to the most vulnerable refugees from Croatia and Bosnia and Herzegovina. 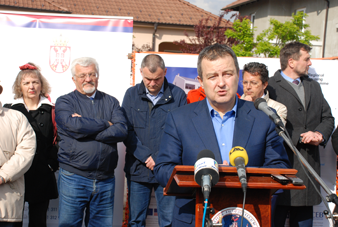 It is with the undisguised pleasure that I can inform you that the works on the construction of apartments under the RHP subproject 2 on all locations are very good," said Minister Ivica Dacic. 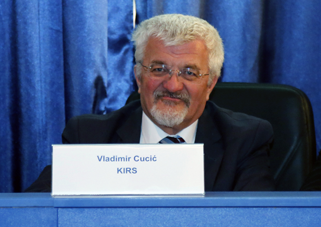 Commissioner Vladimir Cucic thanked the city of Kikinda for receiving 7,200 refugees in the past, and for actively participating in the implementation of the Regional Housing Program. "A hundred and five refugee families in Kikinda have been helped through the RHP so far. I will only mention some figures - in addition to these 25 apartments in Pere Segedinca, another 16 apartment units will be built in the neighboring Dusan Vasiljev Street, while14 village houses are already allocated and the contracts are ready for another 13. In addition, 24 families already received the first part of the assistance in building materials and it is expected that the agreements will be signed for 13 more packages for the same number of families ... all this illustrates that what we are doing is worthwhile and well done," emphasized Commissioner Cucic and told the beneficiaries that he is looking forward to seeing them again when their new homes are ready. A ceremony marking the commencement of construction of 20 apartments for refugees from Bosnia and Herzegovina and Croatia, residing in the territory of the City of Uzice, was held today in the city’s municipality of Sevojno. The total value of construction is at 409,846 euros with the majority of financial resources provided from the Donor Fund of the Regional Housing Programme, where the EU is the main donor. The construction of apartments under the fourth sub-project of the Regional Housing Programme in the Republic of Serbia is taking place on the location of Viseslava Bugarinovica Street and the deadline for the completion of the construction is the end of 2018. Within the sub-project 4, a total of 661 housing solutions worth 13 million euros are allocated. In addition to the construction site in Sevojno, additional 11 sites are open across Serbia (Arilje, Negotin, Kladovo, Bor, Loznica, Vrnjacka Banja, Brus, Stara Pazova, Zrenjanin, Temerin and Sombor). Within the other components of this subproject, 30 prefabricated houses along with 300 packages of building material as well as 129 village houses are also delivered. Mr. Ivica Dačić, First Deputy Prime Minister of the Government of the Republic of Serbia, Minister of Foreign Affairs and President of the Commission for Coordination of the Process of Permanent Integration of Refugees, Mr. Vladimir Cucić, Commissioner for Refugees and Migration, Mr. Bojan Stević, State Secretary in the Ministry of Public Administration and Local Self-Government, Mr. Tihomir Petković, Mayor of Uzice and Mr. Dragan Katuca, Director of the Project Implementation Unit in the public sector addressed the gathering, highlighting the importance of RHP in Serbia, thanking the donors, especially the EU who is the major donor, for their continuous support and wished the beneficiaries a quick end-of-year reunion when their new homes will be ready. „I am proud of the results that this Program achieves, which tells us that it will be successfully implemented until the end”, - said First Deputy Prime Minister and Minister of Foreign Affairs Ivica Dacic. Commissioner Cucic reminded that Uzice received a large number of refugees in 1992 and stressed that Serbia as a country should be proud of how much it has endured when it comes to refugees from BiH and Croatia. "We are now coming to a stage, when in a large number of towns throughout Serbia, we slowly close this difficult chapters, while providing housing to the most vulnerable families," said Commissioner Cucic. 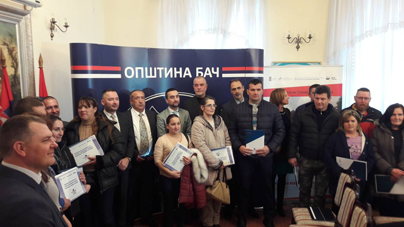 Eight refugees families from Bosnia and Herzegovina and Croatia with the residence in the Municipality of Vladimirci received agreements for the packages of building material within the fifth subproject of the Regional Housing Programme in the Republic of Serbia (RHP). Besides the President of the Municipality of Vladimirci, Milorad Milinkovic, as the host of the event, the President of the Municipal Assembly of Vladimirci Dragan Simenunovic, representative of the U.S. Embassy Sam Healey, representative of the UNHCR Violeta Maric, county coordinator for Macva of the Commissariat for Refugees and Migration Zeljko Janic, representatives of PIU Stefan Trmcic and Drago Jovovic, trustee for refuges Petar Popovic and other municipal officials also attenede the RHP event. On behalf of the Commissariat for Refugees and Migration, Zeljko Janic highlighted a very good cooperation with the Municipality of Vladimirci in the implementation of the RHP and thanked the international donors, the EU as the largest donor, in supporting this Programme. Keys for 40 apartments for refugees from Bosnia and Herzegovina and the Republic of Croatia were handed over today in Sremska Mitrovica undred the second subproject of the Regional Housing Programme in the Republic of Serbia (RHP). The project is financed by the Fund of the Regional Housing Programme with 680.000 Euros, along with the contribution of the City of Sremska Mitrovica of 14.5 million dinars. Contractor is a building company "Diagonal" ltd Novi Sad. Subproject 2 of the RHP is worth a a little over 13 million euros and a total of 200 apartments are built in nine units of local self-government within this subproject. Moreover, 250 rural households have been purchased, 120 prefabricated houses have been built and 330 packages of building materials have been delivered. The ceremony was attended by Ivica Dacic, First Deputy Prime Minister, Minister of Foreign Affairs and President of the Commission for Coordination of the Process of Integration of Refugees of the Government of the Republic of Serbia, Vladimir Sanader, Mayor of Sremska Mitrovica, Vladimir Cucic, Commissioner for Refugees and Migration, Yngve Engstroem, Head of Cooperation at the EU Delegation, Stephan Sellen, Deputy Director of the Directorate General for Loans and Social Development, Council of Europe Development Bank, Hans F. Schodder, Representative of UNHCR in Serbia, Joseph Mellott, the Deputy Head of the OSCE Mission to Serbia, Dragan Katuca Director of the Project Implementation Unit in the public sector, and many other officials and RHP partners from the region. "The Serbian government together with other partners remains strongly committed and engaged in the implementation of the Regional Housing Programme, which will provide a roof over the head for more than six thousand families in Serbia. For me personally, this day has a special symbolism and arouses the emotions of triumphs that we achieved in a short time, triumphs not only in the construction and urban sense, but in the sense that enables the continuation of the construction of human life on healthy grounds," said Ivica Dacic, Minister of Foreign Affairs of the Republic of Serbia. Commissioner Cucic thanked the beneficiaries for patiently waiting for the roof over their heads for the past twenty years. "We are in the stage when we build apartments in a large number of cities throughout Serbia and deliver other forms of housing solutions by which we are finally closing this difficult and tormenting chapter. I wish you a long, healthy and happy life under a new roof, "said Commissioner Cucic. "The European Union is strongly committed to the common EU-Serbia goal of providing the remaining most vulnerable refugees from the war in ex-Yugoslavia with durable housing solutions. Our aim is to reach altogether 3 800 completed housing units by the end of 2018," highlighted Yngve Engstroem from the EU Delegation. Sixteen agreements for building material were awarded to refugee families from Bosnia and Herzegovina and Croatia in the Municipality of Alibunar within the fifth subproject of the Regional Housing Programme in the Republic of Serbia (RHP). 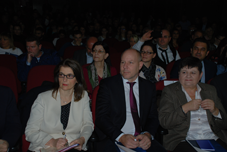 Apart from the President of the Municipality of Alibunar, Dusan Dakic, the ceremony was attended by the Coordinator of the South Banat District, Danijela Loncar, the representative of the Commissariat for Refugees and Migration, Radmilo Dedovic, as well as the representatives of the Project Management Unit in the Public Sector, LLC Belgrade, OSCE, UNHCR and others. On behalf of the Commissariat for Refugees and Migration, Radmilo Dedovic addressed the beneficiaries, and emphasized the excellent cooperation with the Municipality of Alibunar in the implementation of the Regional Housing Programme. He especially thanked the RHP donors, led by the European Union as the largest donor, and thanked the beneficiaries for their patience, wishing them a happy and peaceful life in their new homes. 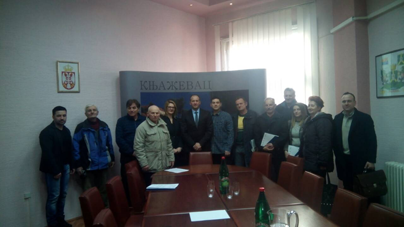 Municipal Mayor Dusan Dakic pointed out that Alibunar will continue to work on improving the standard of living of citizens as well as on opening of new jobs with equal opportunities for all who live or are temporarily residing on the territory of this Municipality. The ceremony marking the beginning of construction of 276 apartments for refugees from Bosnia and Herzegovina and Croatia, residing in the territory of Novi Sad, within the fifth subproject of the Regional Housing Programme (RHP) in the Republic of Serbia took place in Veternik today. The total value of the construction works is 6.4 million euros and the funds are provided mostly from the RHP Donor Fund, where the European Union is the main donor. 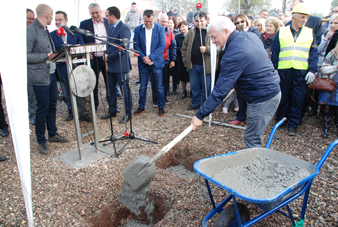 The construction of apartments started in Vojvode Bojovica Street, with a symbolic laying of the foundation stone and the deadline for completion of construction is 15 months (November 2019). Ivica Dacic, First Deputy Prime Minister and Minister of Foreign Affairs and President of the Commission for Coordination of Permanent Integration of Refugees of the Government of the Republic of Serbia, Milos Vucevic, Mayor of Novi Sad, Mateja Norcic Stamcar, Chargé d’affaires in the Delegation of the European Union to the Republic of Serbia, Hans Schodder, Representative of UNHCR in Serbia, James Stockstill, Representative of the OSCE Mission to Serbia,Vladimir Cucic, Commissioner for Refugees and Migration, Dragan Katuca, Director of Project Implementation Unit in the Public Sector, Predrag Vuletic, Provincial Secretary for Social Policy, Demography and Gender Equality, Dusko Cutilo, Director of the Fund for Assisting Refugees, Expelled and Displaced Persons as well as numerous other representatives of government and international institutions and beneficiaries attended the ceremony. 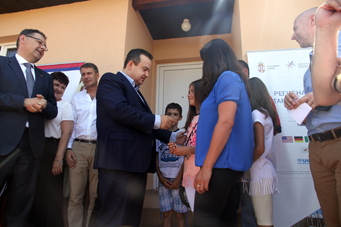 Minister Dacic thanked donors, as well as everyone in the government of the Republic of Serbia and local self-governments for a very responsible approach to the implementation of the Regional Housing Programme. 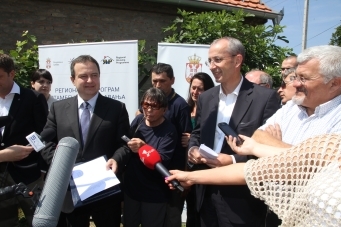 "We have completed a significant part of the program so by the end of the year, more than 3,000 families will be taken care of, but we still need to keep working," Dacic said, adding that he hopes that the upcoming works will run smoothly and will be terminated within the deadlines. Commissioner Cucic thanked beneficiaries for their patience and pointed out that they are the true future hosts who will receive the new homes through the Regional Housing Programme after many years and that the Republic of Serbia will always be home to them. The Mayor of Novi Sad, Milos Vucevic, thanked the Government of the Republic of Serbia and the Commissariat for Refugees and Migration, as well as the European Union and other donor countries for their support. "I expect that at the beginning of 2020 we will gather in this same place and attend the ceremony when 276 families who have suffered great injustice will move into their new apartments. At the same time, we are preparing, with the same partners, the construction of 152 apartments in Futog and an additional investment here in Veternik, "said Vucevic. RHP subproject 5 is worth a total of 46.7 million euros. From this amount, the approved international donations amount to 36.3 million euros, and the Republic of Serbia’s contribution is 10.4 million euros. In addition to the allocation of 250 packages of building materials in 11 municipalities across Serbia and the purchase of 200 rvillage houses in 19 municipalities, this subproject will provide another 1267 apartments in 27 local self-government units for refugee families in the Republic of Serbia. 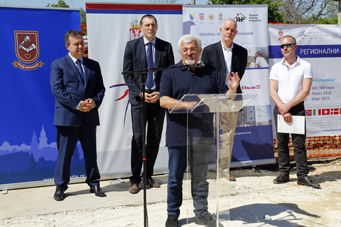 Today in Arilje keys for 15 apartments for refugees from Bosnia and Herzegovina and the Republic of Croatia were ceremonially handed over under the fourth subproject of the Regional Housing Programme (RHP). The facility is financed from the Fund of the Regional Housing Programme with 330,000 euros, with the contribution of the Municipality of Arilje of ten million dinars. Contractor is GP "Kej" d.o.o. Valjevo. RHP subproject 4 is worth more than 13 million euros. Within this project, a total of 661 housing solutions are awarded: 30 prefabricated houses, 261 apartments, 300 building materials packages and 70 village houses. Moreover, four multi-storey buildings are planned to be built in 13 units of local self-government. The building in Arilje was one of the first, while the rest are being built in Loznica, Negotin, Temerin, Sombor, Brus, Bor, Zrenjanin, Uzice (Sevojno), Stara Pazova (Golubinci), Odzaci, Vrnjacka Banja and Kladovo. The ceremony was attended by Ivica Dacic, First Deputy Prime Minister, Minister of Foreign Affairs and President of the Commission for Coordination of the Process of Permanent Integration of Refugees of the Government of the Republic of Serbia, Vladimir Cucic, Commissioner for Refugees and Migration of the Republic of Serbia, Zoran Todorovic, President of the Arilje Municipality, Nicolas Bizel, Head of Operations I of the EU Delegation to the Republic of Serbia, John Andrew Young, Representative of UNHCR in Serbia, Joseph Mellott, Deputy Head of the OSCE Mission to Serbia, representatives of PIU, other government and international institutions, guests from the region and many others. The foundation stone was laid today for the construction of 169 apartments for refugee families from Bosnia and Herzegovina and Croatia, residing in the territory of the Municipality of Stara Pazova, within the fifth subproject of the Regional Housing Programme in the Republic of Serbia (RHP). The funds for the construction of the apartments were provided partly from the Donor Fund of the Regional Housing Programme, managed by the Bank for Development of the Council of Europe, and partly from the budget of the Municipality of Stara Pazova. RHP fund donated 3.9 million euros, while the contribution of Stara Pazova is over 55 million dinars. Construction of apartments commences at Fruškogorska Street bb. Contractor is "Zlatibor gradnja Beograd" AD and "Kej" d.o.o. Valjevo. The deadline for the completion of construction is July 2019. Seven lamellas are built, total gross surface is 11.654 m2. Subproject 5 is worth 52 million euros. The approved international donations amount to 38.8 million euros, and the Republic of Serbia’s contribution is 13.2 million euros. The event was attended by Ivica Dacic, First Deputy Prime Minister, Minister of Foreign Affairs and President of the Commission for Coordination of the Process of Permanent Refugee Integration, Vladimiri Cucic, Commissioner for Refugees and Migration, H.E. 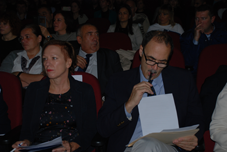 Sem Fabrizi, Head of Delegation of the European Union to the Republic of Serbia, H.E. Kyle R. Scott, Ambassador of the USA in Serbia, H.Е. Dorothea Gieselmann, Chargé d’Affaires a.i. German Embassy, Anil Kajalar Deputy Head of Mission of the Turkih Embassy, Igor Vencel, Chargé d’Affaires a.i. Embassy of Slovakia, Djordje Radinovic, President of the Stara Pazova Municipality, Bojan Stevic, State Secretary in the Ministry of Public Administration and Local-Self Government, Andrei Kazakov, Acting Representative of the UNHCR in Serbia, Joseph Mellott , Deputy Head of the OSCE Mission to Serbia, Dragan Katuca, director of PIU and others. "Construction of housing units in Stara Pazova is one of the stages in the realization of the Regional Housing Programme, the most important regional initiative for resolving long-term displacement as a consequence of the conflict in the territory of the former Yugoslavia in the period 1991-1995. The Republic of Serbia is extremely dedicated to completing this program and fully contributes to the implementation of the agreed obligations, as evidenced by our presence here on laying the foundation stone in Stara Pazova, "said First Deputy Prime Minister Ivica Dacic. The Commissioner for Refugees and Migration, Vladimir Cucic, thanked all the guests, without whom, as he pointed out, we would not be here today. "From now on, the construction workers have a word. May their work be as happy as all those people who are waiting for these apartments, "said Commissioner Cucic. The Head of the EU Delegation in Serbia, Sem Fabrizi, stressed that today’s laying of the foundation stone represents the beginning of a new life for many families, so this is not just a matter of constructing a building. US Ambassador Kyle Scott said that the United States is very proud to be a partner in the Regional Housing Programme, which has already provided a roof over the head for more than 3,000 families. Twenty one agreements for purchising packages of building material for refugees from Bosnia and Herzegovina and Croatia were awarded today in the Municipality of Secanj under the fourth subproject of the Regional Housing Programme in the Republic of Serbia (RHP). Funds in the amount of EUR 180,000 for the purchase of 21 packages of building materials were provided from the Donor Fund of the Regional Housing Programme through the Council of Europe Development Bank. Subproject 4 is worth a total of 18.7 million euros, of which 16.7 million is from the RHP fund, while 2 million euros are a national contribution. It is envisaged to allocate a total of 1,233 housing solutions, 30 prefabricated houses, 261 housing units, 562 building materials packages and 329 village houses in municipalities throughout Serbia. Beside the President of the Municipality of Secanj, Mr. Predrag Radjenovic as the host of the event, representatives of the Commissariat for Refugees and Migration, the UNHCR, as well as representatives of the Project Implementation Unit in Public Sector (PIU) and beneficiaries were present at the ceremony. The Regional Housing Programme (RHP) was set up to provide durable housing solutions to vulnerable refugees and displaced persons following the 1991-1995 conflicts on the territory of former Yugoslavia. The RHP is implemented by Bosnia and Herzegovina, Croatia, Montenegro and Serbia and mostly financed by the international donor community. The main donor is the European Union. The other donors are the United States of America, Germany, Norway, Italy, Switzerland, Denmark, Turkey, Luxembourg, Spain, Cyprus, the Czech Republic, Hungary, Romania and the Slovak Republic. Forty three agreements were signed today in the Municipality of Becej for the purchase of building material for refugee families from Bosnia and Herzegovina and Croatia, under the fifth subproject of the Regional Housing Programme (RHP). Funds in the amount of 270 thousand euros for the purchase of 43 packages of building material were provided from the RHP Donor Fund through the Council of Europe Development Bank. Subproject 5 RHP is worth a total of 52 million euros, out of which 38.8 is donated from the RHP Fund, and 13.2 euros from the national contribution. Beside the President of the Municipality of Becej, Dragan Tosic, as a host of the event, the Assistant Commissioner for Refugees and Migration of the Republic of Serbia, Ivan Gerginov, Director of the Provincial Fund for Assistance to Refugees, Displaced and Expelled Persons, Dusko Cutilo, representatives of the United States Embassy, the OSCE, the UNHCR, as well as representatives of the Project Implementation Unit (PIU) attended the ceremony and awarder the agreements.